The Ceiling of Art series is part of a process started in 2002 (Rome). It is now composed of 27 paintings realised in different contexts such as a de-consecrated convent, a gallery exhibition space and a garden of nettles. 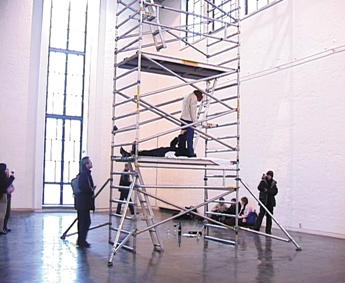 This film begins with a visit to the Vatican and continues under the ceilings of the Taidehalli Museum, Kunsthalle Helsinki, for the exhibition “Là-bas” (2003).